Title: Shall We Join the Ladies? 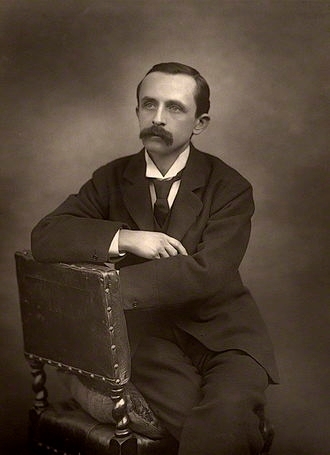 Sir James Matthew Barrie, 1st Baronet, OM (9 May 1860—19 June 1937) was a Scottish novelist and playwright, best remembered today as the creator of Peter Pan. He was born and educated in Scotland but moved to London, where he wrote a number of successful novels and plays. There he met the Llewelyn Davies boys, who inspired him to write about a baby boy who has magical adventures in Kensington Gardens (included in The Little White Bird), then to write Peter Pan, or The Boy Who Wouldn't Grow Up, a "fairy play" about an ageless boy and an ordinary girl named Wendy who have adventures in the fantasy setting of Neverland. Although he continued to write successfully, Peter Pan overshadowed his other work, and is credited with popularising the name Wendy. Barrie unofficially adopted the Davies boys following the deaths of their parents. Barrie was made a baronet by George V on 14 June 1913, and a member of the Order of Merit in the 1922 New Year Honours. Before his death, he gave the rights to the Peter Pan works to Great Ormond Street Hospital for Children in London, which continues to benefit from them.--Wikipedia. Epub 20111011.epub If you cannot open a .mobi file on your mobile device, please use .epub with an appropriate eReader. Mobi/Kindle 20111011.mobi Not all Kindles or Kindle apps open all .mobi files.